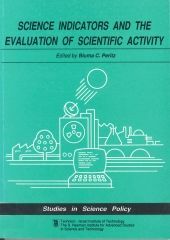 The evaluation of scientific activity has always been a difficult endeavor because of both its long-range effects and the intrinsic uncertainty of this kind of research. In these times of growing budgetary constraints, such evaluation has become a significant tool in assessing the "track records" of scientific organizations (universities and research institutes) and of funding agencies. The S. Neaman Institute, the Technion's policy-research institute, which has been active in this field for several years, has sponsored a session on indicators for the evaluation of science in Israel and abroad. The session took place at the Info-91 Conference, Israel premier Information Science forum, and the papers presented there are brought together in the present volume. This collection of papers includes a wide variety of approaches. One of the leading scientometric researchers in the field, Dr. A. Schubert of the Hungarian Academy of Science presented an overview of the use of citations in the evaluation process. B. Peritz discussed the role and significance of citation-based measurements. G. Czapski looked at some of Israel's science indicators in a comparative context. Finally, S. Herskovic analyzed patent statistics as indicators of scientific and technological activity. The audience felt that this had been a useful and informative session. We hope, therefore, that this little volume too will serve as a valuable source.